This morning (26 August) my eye was caught by news of a new centre-ground think tank Radix, led by Nick Tyrone and including Nick Clegg, Stephen Kinnock and Andrew Lansley. This comes a short time after the launch of another centre initiative, involving Paddy Ashdown, More United, seeking to change the centre ground in another way. These are welcome responses to the crisis we are now in. Brexiteers beginning to discover the impossibility of their task: creating an urgent need for a sane centre progressive option. In November I will give a paper on the fallout of the EU referendum at the conference of OPUS (Organisation for Promoting Understanding of Society) entitled “The King is dead, there is now no king”. That’s a parody of the phase “The King is dead, Long live the King” which caught the sense of a monarchy trying to quell potential instability when a king died. The thinking is that the EU has been the containing structure for much of our political and national life for a long time: in voting for Brexit, people attacked that at a very basic level, which has been reflected in the political turmoil that has followed. The other big idea for that paper is that we are now caught up a very complex response to globalistion. Our democracies are based on the idea that people live, work, and have most of their personal circle in one constituency, so voting for a particular MP to represent them makes sense. But in a globalised world we move around much more than that and are vastly more inter-connected, so the familiar systems are not working, but it is not clear how to replace them. Ironically, the EU seems a good starting point — depending on one’s perspectives it could be seen as a supra-national democracy, or a single market with democratic oversight. Grieving is a natural process for dealing with loss. It can be painful. People often also deny reality, which lets us deal with it gradually. Ultimately grief is a healing process which enables people to process losses and move forward in a healthy way. Owning some of the griefs Liberal Democrats have experienced could be important as part of the journey ahead. 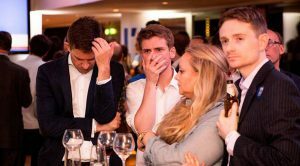 A note about the photo — it shows two Lib Dem activists, Naomi Smith and Paul Pettinger, on the right, after the Brexit result was announced. 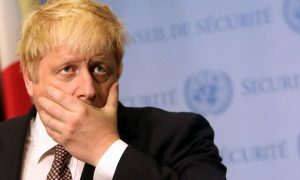 This photo has been published in media around the world; an iconic image of the shock experienced by Remain campaigners. As LibDems, we’ve had a lot to grieve in the last few years. Between 2006 and 2015 each local election seemed to bring losses. Some of the compromises of the coalition were painful. The elections to the European Parliament, the General Election and the EU referendum were excruciating. We shouldn’t let the language of ‘LibDem fightback’ disguise the fact that we have taken a pounding, even as we welcome new members. Author Mark ArgentPosted on 22nd August 2016 23rd August 2016 Categories Liberal Democrat, PoliticsTags Grieving, healingLeave a comment on A time to grieve?